Because of increasingly mobile and socially connected workforces, one of the biggest challenges organizations face today is controlling an explosion in unstructured or semi-structured data. IDC predicted that by 2015, over 83% of total disk storage systems capacity will be shipped to support file-level data. Thankfully, enterprises can supplement their existing storage and compute environments with a software-based storage solution. 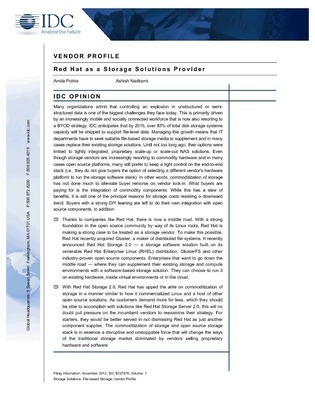 The following white paper profiles a scale-out, open source object-based storage software solution and the benefits it provides for businesses looking for a middle road when integrating data.